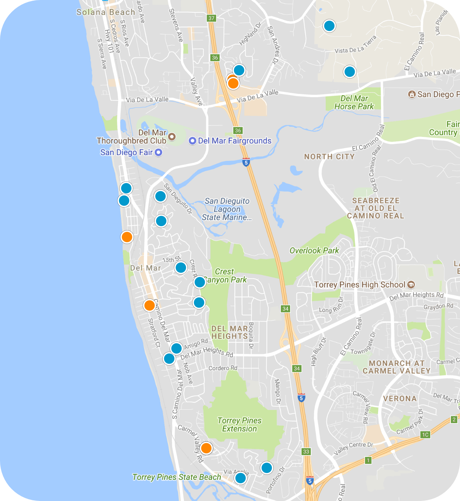 San Diego Home Sales website search offers all Del Mar homes, condos and foreclosures for sale. You are able to get new property listings daily that meet your search criteria. If you’ve been to Del Mar even once, you’ll understand the reason for the popularity of this seaside community. Noted for its small community charm, magnificent beaches, fair weather, a picturesque town center, and a world renown thoroughbred race track, Del Mar is a dream location for residents and one of California’s most sought after vacation rental destinations. Two square miles of coastal land presenting breathtaking views over the Pacific make Del Mar a small, coastal town of the San Diego County. Del Mar is bounded by the Pacific Ocean to the west, Solana Beach to the north and the City of San Diego to the south and east. Because of coastal Del Mar’s charm with beautiful beaches and its location just a short drive from La Jolla and Sorrento Valley business and research centers, it continues to be one of the most popular areas in San Diego County.